Sonny Simmons is an American free jazz saxophonist legend born in 1933. Although he's now over 80 years old, he hasn't lost his will to explore new areas and that's what his doing with Moksha Samnyasin, a bass-drums-sitar trio consisting of French musicians Thomas Bellier (Spindrift, Blaak Heat Shujaa), Sebastien Bismuth (Abrahma) and Michel Kristof (Other Matter). 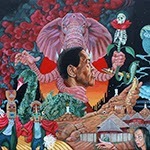 I love Blaak Heat Shujaa, and this project has a sort of similar, mystical and psychedelic vibe, but no guitar at all. The bass and drums on slow, long and hypnotic tracks also remind me of Om, but without vocals and with the very cool sax and English horn. Sitar enhances the mystical, spiritual, Middle and Far Eastern moods, and the subtle, spacey psych effects add to the mind-altering quality of the excellent, experimental and improvisation-based album. Sometimes the band even rocks a bit (like at the end of the first, long track "Help Them Through This World") , but most of the album is rather peaceful and meditative. The album was released at the end of November last year and the limited vinyl versions are already sold-out from the label so hurry up if you want a copy! Also available on CD and as a digital download. One of the most interesting releases on Svart for sure. The Linus Pauling Quartet: C Is fir Cthulhu 7"